As we continue to discover and share ideas and activities for our guests to enhance their stay with us (should they ever decide to leave the sun loungers besides the pool, that is), it occurred to us that an article on the Andalusian city of Granada was long overdue. True, there's an awful lot to appreciate within just a one day visit: the beauty and intricacy of the Alhambra Palace, glowing warmly in front of its backdrop of the Sierra Nevada mountains; the winding cobbled streets and colourful bazaars of Albaicín; the humbling magnificence of the Cathedral; and the dazzling glory of the Basilica of St John of God. But these delights and more are why you simply must go. 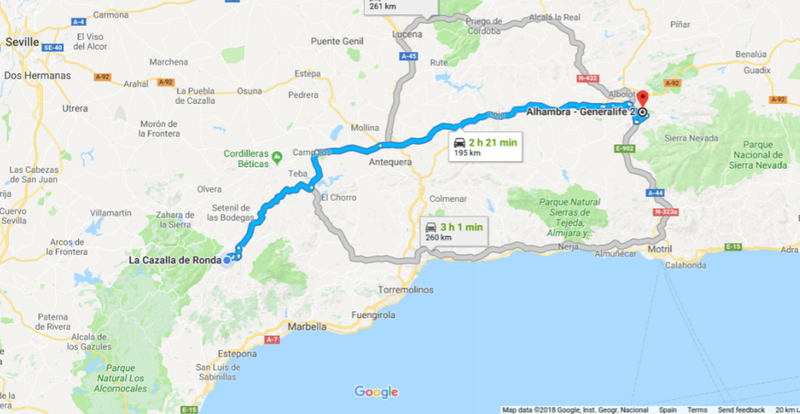 Wake up with the valley's birdsong and take the easy two-hour drive from La Cazalla, stopping on the way for molletes with olive oil, tomatoes and garlic (honest - don't knock this Andalusian breakfast until you've tried it!) and spend your day soaking in the multicultural ambience of the city of Granada. Granada is located at the foot of the Sierra Nevada mountains, at the confluence of four rivers: the Darro, the Genil, the Monachil and the Beiro. The region surrounding the city has been populated since at least 5,500 BC and experienced Roman and Visigothic influences, and occupation by Sephardic Jews and the Nasrid dynasty Muslims (who aligned themselves with Fernando III of Castile, officially becoming the Emirate of Granada in 1238). Firstly, to avoid any unnecessary queuing or disappointment on the day, we advise our guests to book the entrance ticket to the palace in advance. This can be done on the Alhambra and Generalife's official ticket sale website from 2 hours to 3 months in advance of your visit and costs just €14 per person for 'access all areas'. Entrance to the Nasrid Palaces is controlled to avoid congestion, and ticket holders receive a time for their visit so that everyone will have an opportunity to explore these incredibly beautiful buildings. Alhambra itself is really a walled city within a city, comprising royal apartments, a defensive zone (the Alcazaba), forts, pavilions, and the Generalife palace, gardens and orchards. Moorish poets described it as "a pearl set in emeralds" - an allusion to the colour of its buildings and the woods surrounding them. 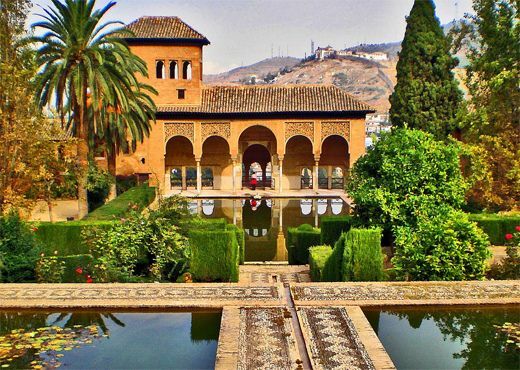 Each palace is different, as the Muslim rulers who lived there extended the complex and left their mark on Alhambra, with high towers, intricate Islamic architecture and mosaics, columned walkways, and landscaped courtyards with fountains and reflecting pools. Each new section added followed the consistent theme of "paradise on earth". 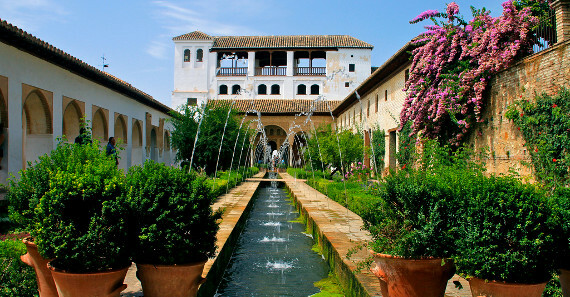 Of the outlying buildings connected to Alhambra, by far the most interesting and beautiful is the Palacio de Generalife (the "Garden of the Architect"). The villa dates from the beginning of the 14th century and is composed of a series of large gardens, where every corner holds a novelty and a pleasant surprise for the eyes. Stay a while on the patio and submerge yourself in the sights and sounds of this sensual water garden. The Alhambra is open every day except Christmas Day and New Year's Day from 8.30 am to 8.00 pm (closing at the earlier time of 6.00 pm during the winter months). Make sure you take some drinking water with you, particularly if you will be visiting during the hot summer months of July and August. Following a leisurely lunch, we recommend visiting Albaicín, the old Arabic quarter located on the hill opposite the Alhambra, via the Granada Cathedral. A 10- to 15-minute walk from either of our recommended restaurants will take you to the magnificent Granada Cathedral, which took 181 years to build. The 4th largest Cathedral in the world, it was requisitioned by Queen Isabella immediately after the conquest of Granada and is a masterpiece of Spanish Renaissance style. The main chapel contains two kneeling effigies of the Catholic King and Queen, Isabel and Ferdinand, and is glorious in white and gold. The Cathedral is open to the public from 10.00 am to 6.30 pm Monday to Saturday, and from 3.00 pm to 6:00 pm on Sundays and Public Holidays. €5 will allow you entrance and provide you with a self-guided audio tour, which takes around an hour. After a visit to the Cathedral, you can either continue winding your way through the bazaars of Albaicín towards Mirador San Nicolás, or, if you feel the need for an even greater display of ecclesiastical opulence, take a slight detour on Calle San Jerónimo to the golden Basilica of San Juan de Dios (St John of God) on Calle San Juan de Dios. Joao Duarte Cidade began his life a homeless orphan in 15th century Portugal. He became a soldier, a bookbinder and bookseller, and later a health worker, devoting the rest of his life to the care of the sick, the mentally unstable and the homeless. His travels took him around the world, but he finally settled in Andalusia, where he is said to have had a vision of the infant Jesus, causing him to change his name to Juan de Dios. Today the buildings attached to the Basilica bear his legacy: there's a daily soup kitchen and various clinics and a hospital to aid the less fortunate of the city. The Basilica is open from 10.00 am to 1.00 pm and 4.00 pm to 7.00 pm Monday to Saturday, and from 4.00 pm to 7.00 pm on Sundays. Entry costs just €4, which includes a hand-held audio guide available in 5 languages. Albaicín is the old Arabic quarter located on the hill opposite the Alhambra. It is characterised by cobble-stoned streets with white washed houses. The traditional type of house is the carmen, consisting of a freestanding house surrounded by a high wall that separates it from the street and including a small orchard or garden. Albaicín maintains the urban layout of the Moorish period, with narrow streets winding in an intricate network that extends from the top at San Nicolás and through Calle Elvira, both located in Plaza Nueva, by the course of the river Darro. The neighbourhood is a delightful maze of small, meandering alleys and streets with something to discover around every corner - shops, boutiques, cafes. bars - selling everything from silk, trinkets, food, wine, spices and leather goods. It's a joy just to stroll around and take everything in. If you can manage the uphill climb, aim to end your day's walking tour at the Mirador San Nicolás. From here you can achieve one of those classic sunset shots of the Alhambra sprawled along a wooded hilltop with the dark Sierra Nevada mountains looming in the background. It's a well-known spot, accessible via Callejón de San Cecilio, so expect crowds of camera-toting tourists, students and buskers. 1st February is the day of the Patron of the city of Granada. It is a tradition to visit the catacombs and the Monastery of Sacromonte. San Cecilio is celebrated on the first Sunday of February, on which day there is a pilgrimage that goes up to the Sacromonte to the catacombs of the saint. You can see processions and enjoy some good wine along with the traditional dances. Easter Holy Week (Semana Santa) in Granada is unique when compared with how other Andalusian cities celebrate it. The narrow, winding streets of Albaicín give a special setting to the procession of the Virgen de la Aurora and the Concepción. Corpus Christi in June is the grandest of all the festivals of Granada. 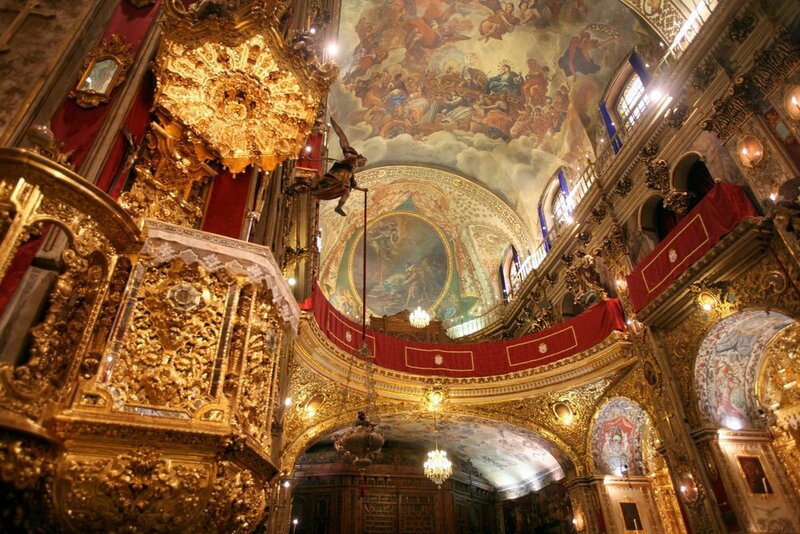 Puppet shows, bullfights, processions and flamenco performances take place. Señora Angustias in September is the feast day of the patron saint of the city. The façade of the church is covered with flowers, there are also processions, festivities and bullfights. No matter what time of year you choose to visit this fascinating Andalusian city, we are sure you will adore it. For more information on things to do during your stay with us in Ronda, check out our website page or contact us with your questions - we're always happy to help.